Mt. Moriah-East Baptist Church was organized 1891 in the Suzette Bottom District of Memphis, bordered by the present streets of Crump, Walnut, Tate and the railroad. In 1915, the congregation relocated at 239 South Orleans, moving into chapel facilities that had been vacated by LeMoyne Normal Institute, presently known as LeMoyne-Owen College. 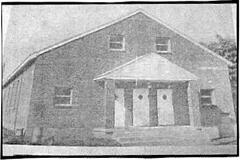 Melvin Charles Smith was called to serve as Pastor in 1967 and, in 1972, the congregation relocated to Haynes Road and built its first edifice. In 1977, the second building, the Gammon-Campbell Fellowship Hall was erected. 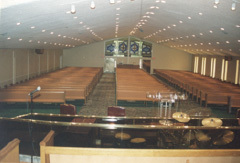 Then, in 1987, a new sanctuary was built. 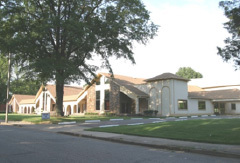 In 2001, the Church expanded again by enlarging the Sanctuary and constructing a multi-purpose family life center, later named the Melvin Charles Smith Trinity Complex. Currently, the physical plant of Mt. Moriah-East Baptist Church consists of a thousand-seat sanctuary, 2 office wings, 10 classrooms, library, computer lab, nursery, 60 seat chapel, conference rooms, heritage room, meditation lobby, 2 kitchens, fellowship hall, gym facility, and secured off-street parking for 500 cars. Mt. Moriah-East Baptist Church also owns residential dwellings and land on Haynes, Rutledge and Kimball.
" A beacon of light in the Memphis Community since 1891"